Available with a choice of either a 148 hp 2.0-liter or 168 hp 2.4-liter engine, the Outlander Sport is a tardy performer regardless of whether it is fitted with the 5-speed manual or CVT transmission. Quality and refinement levels are low but standard equipment levels are generous including climate control and Bluetooth connectivity, if you must have one we recommend capitalising on the low pricing by sticking to one of the entry level trim options. 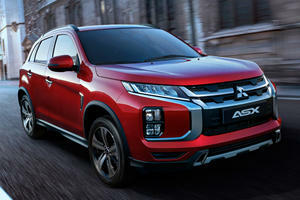 The Mitsubishi Outlander Sport sits at the budget end of the compact SUV segment, it offers decent specification levels although none of the driving refinement that is to be found in newer although admittedly more expensive rivals. For 2017 it receives a small bump in standard equipment levels and revised trim offerings. 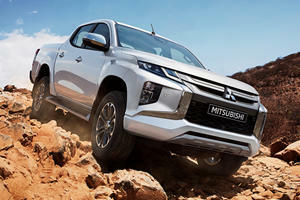 Befitting its low price, the little Mitsubishi offers little in the way of luxury touches. 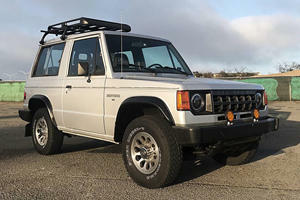 The quality of fit and finish as well as the materials used are more in line with an economy hatchback than an SUV and it sits at the bottom of its class in this regard. The poor seat padding and limited interior space is another fact that shoppers lured in by that low sticker price will have to live with. The mediocre cargo space hides no surprises either as it too offers very little capacity compared to rivals. The sportiest thing about the Mitsubishi Outlander Sport is its name, whatever the drivetrain configuration the indirect steering and nervy hair-trigger throttle response during pull-off make for an uneasy, and at times, frustrating drive. Braking and direction changes should not be made in haste as the Outlander Sport does not inspire confidence in its responses when pushed. The ride is particularly poor with bumpy roads causing the Outlander Sport to bounce around uncomfortably. Over smoother surfaces the ride naturally improves but it is nowhere near what one would expect from a modern SUV. 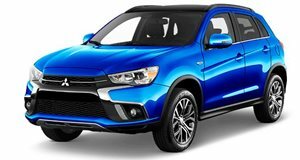 The Outlander Sport is available with either a 2.0-liter (148 horsepower, 145 lb-ft of torque) or 2.4-liter (168 hp, 167 lb-ft of torque) inline-4 engine. The base ES 2.0-liter is the only one available with a 5-speed manual transmission, it may be an outdated unit but the rest of the range get an even more unsatisfying CVT transmission that reduces fuel efficiency, blunts any available performance all the while keeping the engine droning along unhappily. Both versions are underpowered although the 168 hp 2.4-liter does provide slightly improved acceleration just about matching the class average. The Outlander Sport may fall short in many areas but a poor standard specification list is not one of them. The base ES trim is available only with the 2.0-liter engine and 5-speed manual, some of its notable features include Bluetooth connectivity with USB port, cruise control, climate control, leather-wrapped steering wheel and heated mirrors. And a 4-speaker sound system. LE trim adds the CVT transmission, aluminum pedals, heated driver and front passenger seat, 6.5-inch display with Apple CarPlay and Android Auto integration and a rearview camera. A leather wrapped parking brake and red stitching on the controls are unique to the LE trim. SE trim and higher replaces the 2.0-liter engine with the 2.4-liter unit and oddly a 6.1-inch touchscreen display that does not offer mobile phone integration. It also makes do without the aluminum pedals. A 6-speaker sound system and stop/start button round off the changes. The top SEL trim offers leather trim, 8-way power driver seat, the aluminum pedals are back and you also get an auto-dimming rearview mirror and slide adjustable center armrest. The CVT transmission also gets paddle-shifters. Front-wheel drive is standard with all-wheel drive optional across the range. Safety features include a multitude of airbags, traction control, active stability control and hill start assist. A number of individual lifestyle accessory options are available as well as a 7-inch navigation system. A very generous 10 year, 100,000 mile powertrain warranty is also standard across the range. The Mitsubishi Outlander Sport is a budget offering which will appeal to shoppers looking for a good specification level and are not too concerned about a modern driving experience. Its sole USP is a bargain basement price, although the uncomfortable ride, poor quality interior and uninspiring handling may be too much for some.